Adjacent to Stanford University’s historic Hoover Tower in Palo Alto, CA is the newly constructed David and Joan Traitel Building for the Hoover Institution. The Hoover Institution is an organization that collects knowledge and generates ideas, seeking to “secure and safeguard peace, improve the human condition, and limit government intrusion into the lives of individuals.” Over the last several decades, the Hoover Institution has grown significantly both in size and influence, requiring additional space to house scholars and administrators, and to conduct larger conferences and workshops. 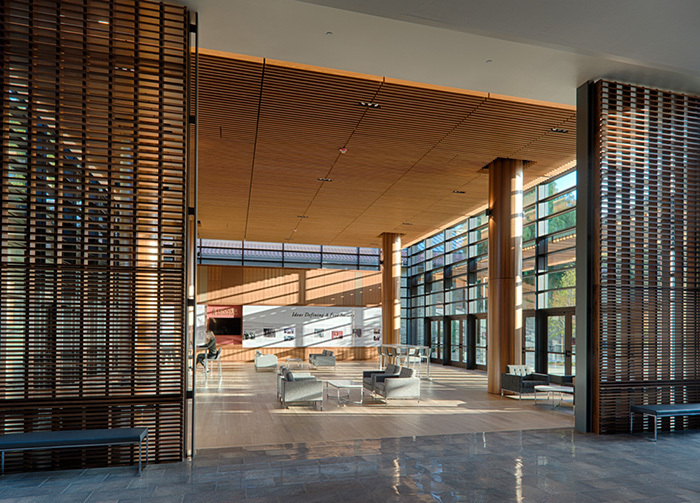 In response, Stanford University constructed the 55,000 square foot Traitel Building. The new space significantly increased capacity in office space and conferencing facilities in order to meet the increasing demand for policy-oriented research and dissemination. The top floor of the Traitel Building houses the administrative headquarters of the Institution. The ground floor is a conferencing center which includes a large auditorium and a large multipurpose room, both of which can seat over 400 people. In addition, the ground floor hosts a number of lounge and collaborative areas. To help realize their goals, Hoover and Stanford University hired the Boston-based architecture firm, William Rawn Associates and CAW of Palo Alto. For the interiors, Hoover and Stanford worked with interior design studio RMA Studios and Knoll dealer KBM-Hogue San Francisco. The drivers were clear from the beginning: bolster collaboration, increase space for workshops and conferencing, and have the interior strongly relate to the design of the building. For KBM-Hogue and RMA Studios, matching the interior to the building’s vernacular meant using warm textures and natural woods. Leveraging the location, the architects designed the ground floor to harness natural light. To provide shade, large wooden screens were built, casting a beautiful geometric shadow on the ground floor. The result is a large, open space that is warm and inviting. To complement the space, the team proposed Florence Knoll Relaxed Lounge Chairs upholstered in a light grey fabric. The rational geometries that define Florence Knoll’s iconic design echo the gridded window facades. Simultaneously, the light grey textured fabric speaks to the warmth of the space and the more relaxed seat invites people to pause and rest. 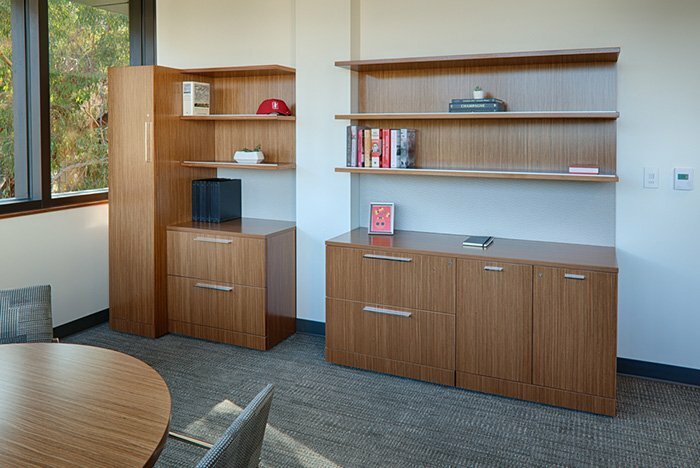 Keeping the building’s architecture top of mind, KBM-Hogue and RMA Studios agreed on natural wood veneers as the primary finish on most furnishings. 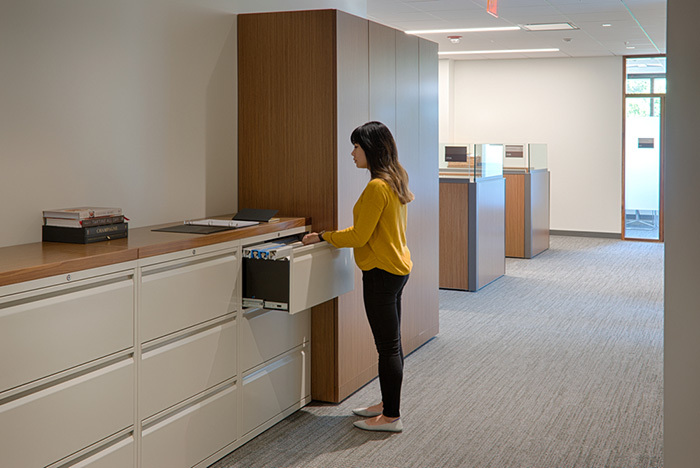 With more private offices than workstations, 34 versus 30, the team agreed that the best furniture solution would deliver a progressive and architectural design solution for private offices and administrative areas. Hoover and Stanford gravitated towards the Reff Profiles™. With unique combinations of wood, glass, aluminum and painted components, Reff Profiles offered a broad range of veneer options. 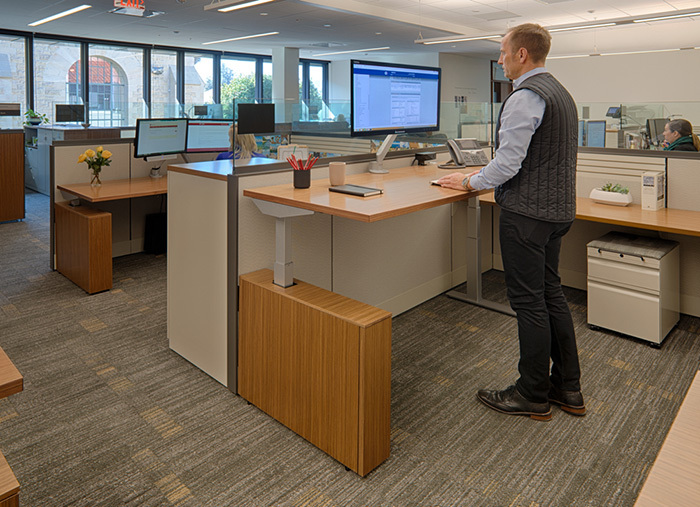 For workstations, Reff Profiles Height Adjustable Tables were installed to provide the staff enhanced well-being. Given the high volume of material, storage needs were also a top priority. In order to maximize efficiency, the team recommended a mixture of Anchor™ and Template® storage for its ability to support individual storage needs. For filing, the team recommended Calibre® for its excellent organizational options.